Making someone enter a pattern, PIN, or password before they can use your Galaxy Tab S2 NOOK is like locking the front door. But if you really want to secure your tablet’s contents, consider encrypting the device, or the external microSDHC card, or both. An encrypted Tab S2 NOOK is difficult (if not impossible) for an amateur to read. Your strongest defense is a complex, unobvious password. Certain other third-party apps may also use the same system or add their own form of encryption. From any Home screen, tap the Apps icon, and then tap the Settings icon. Select an access type from amongst those offered: Pattern, PIN, Fingerprint, or Password. Follow the prompts to record your access code or other information. It doesn’t make sense to use a password like password or private, or to write the password on a sticky note and attach it to your tablet. Oh, and don’t forget your password or PIN or pattern, either. You won’t be able to gain access to the material without it, and the only way to reset this form of security is to do a complete (hard) reset, which deletes all your personal material and some of the system settings and is in just about every respect a true pain in the ear. To help protect your privacy, tap Auto Off. 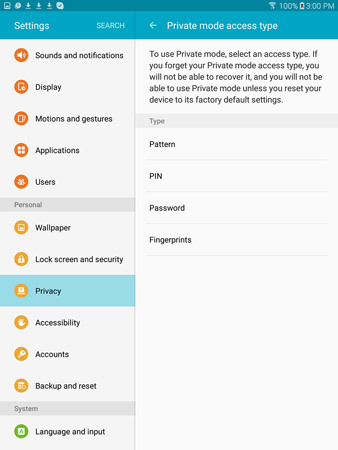 This automatically turns off Private Mode anytime the screen turns off. Otherwise, the Private folder you unlocked is accessible to anyone who uses the tablet until the next time it’s completely shut down and restarted. You can encrypt folders of images, text, and certain other types of files behind a password, pattern, or fingerprint. Don’t forget the code, though, or whatever is held in the folder will be irretrievable by you. Find and select the folder in the Gallery (or in another folder). It has to be eligible to use this procedure. Enter your PIN or password or pattern or allow scanning of your fingerprint to complete the transfer. When you’ve closed a private folder, you can’t see the items in it within MyFiles or Gallery or other applications until you return to Settings and turn on Private Mode, and enter the password, pattern, or fingerprint protection you required.